6-months since the launch of website/product. Our twin boys are also 6-months old. The company was born out of my personal fertility journey. After struggling to get pregnant, I focused on managing my stress and eating healthier, even making my own snack bars after researching the best nutrients for women trying to conceive. I also stopped treating fertility like a big secret and started talking - to friends, specialists anyone that would listen. FertileGirl started as an online community for other women on their own fertility journeys and has evolved into a consumer foods brand that launched its first product, FertileGirl’s superfood nutrition bars, in April 2017. We worked alongside fertility and nutrition experts to formulate this first product. We have a pipeline of additional flavors that are healthy choices for before, during, and after pregnancy. Pre-pregnancy consumer products, especially in functional food, are almost nonexistent. That became our differentiator initially. Many of our customers who’ve now gotten pregnant are still snacking on our superfood nutrition bars and looking for us to put out other products for this time in their life. 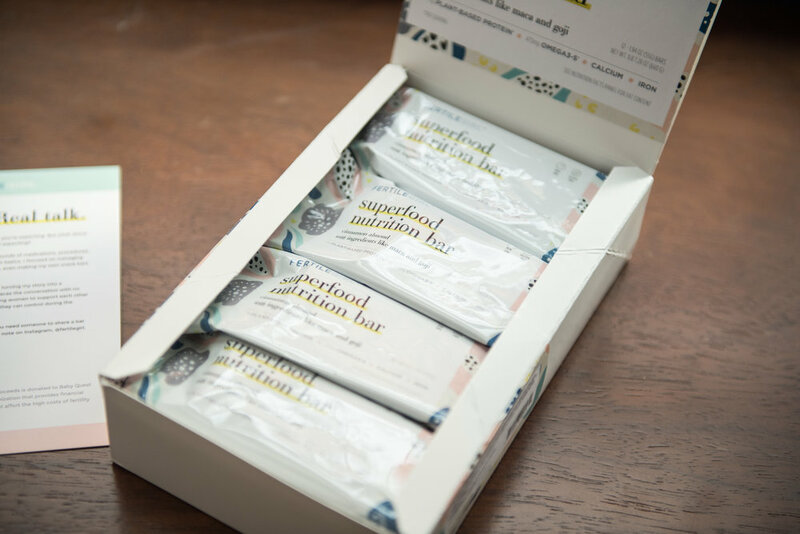 Lactation consultants have also reached out that they’ve been giving our bars to their clients for postnatal nutrition. While there is more competition in these categories, we still have a number of differentiators. First, we work with fertility and nutrition experts to formulate our products because we have an unwavering commitment to make quality products that are not only tasty but also healthy for women in all stages of life. Second, we believe in changing the fertility and pregnancy conversation and are doing so through our content and online community. Lastly, we provide support to Baby Quest Foundation, a nonprofit organization that provides financial grants to couples who can’t afford fertility treatments. The life of an entrepreneur is such a roller coaster ride. It’s been, in some ways, similar to my fertility journey. Many highs and lows. I’ve learned to celebrate the small victories along the way and to take it day-by-day. At the same time, you always have to believe in the longevity of what you’re building because that’s what keeps you going. As long as we keep empowering and inspiring women, I believe there will be a place for FertileGirl, even in this big city. FertileGirl empowers women to make healthy choices while doing our part to change the fertility and pregnancy conversation. We donate a portion of our proceeds to Baby Quest Foundation, a nonprofit organization that provides financial grants to couples who can’t afford fertility treatments like IVF and surrogacy. We are partnering with them, CCRM New York, and Dr. Brian Levine to provide a FertileGirl IVF grant to a NYC couple. Couples can apply through the Baby Quest website and CCRM New York is offering free consultations to couples who mention FertileGirl. My favorite part of my job would have to be the incredible women I’ve met along the way. I’ve met women on their own fertility journeys who have become good friends and supporters of the brand. I’ve also joined an incredible community of NYC female entrepreneurs, and that network is extremely inspiring. Regal Battery Park! Yes, it's a movie theater. Yes, it has reclining seats that you can book in advance. Yes, it’s usually emptier than any other movie theater in NYC. Yes, they don’t stop me from sneaking FertileGirl bars for my mid-movie snack. What more do you need? Also, M Plaza nail salon on Greenwich between Watts and Canal. Those two spots often define my weekend self-care routine. We aim to be a go-to consumer brand for moms and moms-to-be. Besides putting out quality food products for moms and moms-to-be, we’re putting out interesting and informative content for before, during, and after pregnancy. Every day, we try to de-stigmatize the fertility and pregnancy conversation through this content. We get inspiring messages from our followers and customers weekly. Mostly they are thanking us for making them feel like they are not alone. Community and support is so important when it comes to fertility, pregnancy, and postpartum. These are the messages that keep me going! @drbrianlevine, @thehappiestnutritionist, @rootedwellnessny, Fifth Avenue Fertility Wellness (Angela Le), @fertilitytogether, Lindsay Liben Wellness, @glowmaven, and @mamaglow. Mother Yourself! Self-care during pregnancy feels natural and less indulgent; however, it’s so important to extend those self-care routines before and after pregnancy as well. I’ve started to take advantage of subscription services online so I’m not constantly ordering diapers, wipes, etc. (with twins you go through these items fast!). We just added a subscription button to fertilegirl.com for our repeat customers to make their lives easier and provide them a discount.